The FE commissioner is attempting to drum up support for a three-way merger that was cancelled after one of the colleges involved was handed a grade four rating from Ofsted. The education watchdog gave Hereward College, based in Coventry, its lowest possible rating in a report that was published November 21. It had been in talks with two neighbours, City College Coventry and Henley College Coventry, earlier this year about a possible link-up. But the Coventry and Warwickshire area review, which was part of wave three of the reviews, finished by proposing that just City and Henley should join forces. However, FE Week understands that the FE commissioner has visited both colleges in order to persuade them to add Hereward back into their plans. It is also understood that City College governors were due to discuss the proposal at a board meeting last week, though a spokesperson for the college declined to comment on this. This intervention follows the sudden departure of Hereward’s principal Sheila Fleming. She is understood to have left due to illness during Ofsted’s visit in October, and has not returned to the college since. FE Week understands that the Association of Colleges Create, the commercial arm of the AoC, has failed to find an interim principal for Hereward despite a search that has now lasted two weeks. The AoC declined to comment on the status of the search. Hereward Colleges played host to around 570 learners during the last full-contract year, and provides full-time learning programmes at pre-entry level to level three for around 270 learners with high needs. Of these, 26 are in residential provision. Ofsted inspectors were particularly damning in their assessment of safeguarding at the college, which was deemed “ineffective”. It said that its performance self-assessment is inaccurate, and found that governors, leaders and managers had underestimated the significance of serious weaknesses in safeguarding learners, and had failed to comply with the Prevent duty. A spokesperson for Hereward confirmed that Ms Fleming, who took the top job at the college in 2011, was on sick leave but gave no further details on her current situation. The spokesperson also said in an email dated November 22 that a temporary replacement for Ms Fleming was expected to be appointed “this week”. The new appointment will be an interim principal, as it is believed that Ms Fleming may yet return to the post. 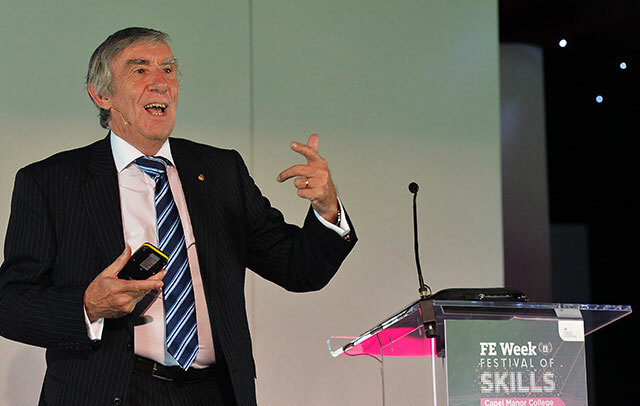 As reported by FE Week in May, the three-way merger involving City College Coventry, Henley College Coventry and Hereward College was endorsed by the former FE commissioner Sir David Collins (pictured above). City College Coventry, which has 6,000 learners, was itself given a grade four in its most recent Ofsted inspection in November 2015, while 3,350-learner Henley College Coventry was given a grade two in January 2014.
Henley College and City College confirmed in a joint statement that their merger plans were still going ahead. “Both colleges are open to possible future strategic developments and have an open dialogue with Hereward College whilst their board considers its options,” the statement said. The Hereward spokesperson said the college had not been aware of merger talks with the other two Coventry colleges. The Department for Education was also unable to comment ahead of publication.